From MEDICOM Toy! Based on the best-selling series Batman: Hush by Jeph Loeb and Jim Lee, Medicom unveils two more releases in their DC Comics Real Action Hero line of 1/6-scale figures. Superman and Batman (Black Suit) are both sculpted from original designs by Jim Lee, and are built using the finest craftmanship and costume tailoring. 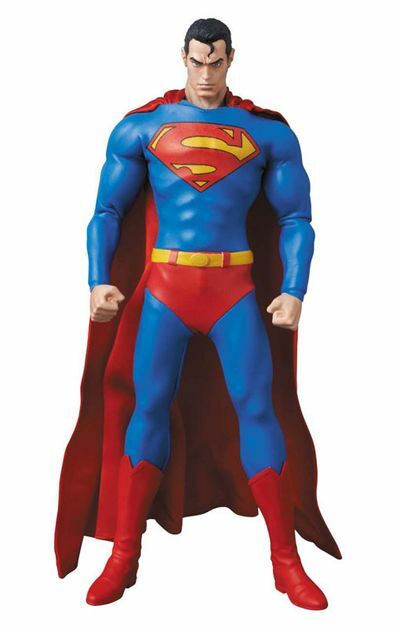 If you can find a nicer looking Batman or Superman, buy him! Other products for "Superman" in "Figures"
Other products for "Superman" in "Accessories"
Other products for "Superman" in "Apparel"
Other products for "Superman" in "Bags"
Other products for "Superman" in "Blu-Ray"
Other products for "Superman" in "Books"
Other products for "Superman" in "Character Goods"
Other products for "Superman" in "DVDs"
Other products for "Superman" in "Key Chains"
Other products for "Superman" in "Plush"